The Maratha empire occupied the Deccan plateau in India. The Hindu Marathas had long lived in the Desh region around Satara, in the western portion of the Deccan plateau, where the plateau meets the eastern slopes of the Western Ghats mountains. They had resisted incursions into the region by the Muslim Moghul rulers of northern India. The lands of the Marathas were ruled in turn by various dynasties, from the Satvahanas, the Chalukyas in various guises, the Rashtrakutas, and the Yadavas of Devagiri, until they were invaded by Alladin Khilji, the sultan of Delhi. The Khilji dynasty ruled the Deccan from their capital at Delhi, and this rule later passed to the Tughlaq dynasty. In the seventeenth century the Marathas found a new leader in the form of Shivaji, the son of the general, Shahaji Bhosale, who had been active in Ahmednagar between 1633-1636, leading the battle against the Moghuls until his defeat, from around 1658, Shivaji was able to free the Marathas from the Muslim sultans of Bijapur to the south-east, and carve out an independent Maratha zone around Pune, incorporating the Bijapur and Golconda sultanates and some Moghul areas. After a lifetime of exploits and guerrilla warfare against the Moghul emperor Aurangzeb, Shivaji died in 1680, leaving a Maratha kingdom of great extent but strategically and vulnerably located. Headman of Hingani Beradi and Diwalgaon villages near Pune. Son. Headman of Verul village. Later a noble in Ahmednagar. Son. General in Ahmednagar and later Bijapur. The Moghul ruler, Aurangzeb, faces constant battles against the Maratha king, Shivaji in the Deccan from his base in Ahmednagar. Increasing his territory by steadily capturing areas of Bijapur and Golconda, Shivaji proclaims himself emperor (chatrapati). Son. Founder of the empire. Brother. Founded the Thanjavur (Tanjore) dynasty. Moghul emperor Aurangzeb deputes Jai Singh of Amer to tackle Shivaji. Shivaji is no match for Jai Singh's mammoth army, and he is forced to sign the Treaty of Purandar. Humiliated and imprisoned by Aurangzeb, Shivaji manages to escape and resume his attacks on the Moghuls, winning back all the forts he had surrendered under the treaty and increasing the size of his fledgling kingdom. Son. Killed by Moghul emperor Aurangzeb. After an alliance with Aurangzeb's son, Prince Akbar, fails, Durgadas, the regent of Marwar, and Akbar take refuge with Sambhaji. In 1682, Aurangzeb himself camps on the Deccan in order to deal with the problem himself, but it takes him until 1689 to capture Sambhaji. Refusing to embrace Islam, the short-tempered Sambhaji dies a tortuous death, but his sacrifice spurs on the Marathas. Shahuji is crowned king, but very quickly afterwards he and his mother are turned over to the Moghuls. A traitor by the name of Suryaji Pisal, the killedar of Fort Raigad, surrenders both them and the fort to General Zulfiqar Khan, soon-to-be nawab of Arcot. Recognising the need for unity, the Marathas immediately elect the Rajaram, Sambhaji's half-brother, as their next king. Uncle and regent in 1689, king thereafter. The capital, Satara, to which Rajaram had earlier moved, is besieged and taken by the Moghuls. Shortly afterwards, Rajaram dies, and his widow, Tarabai, assumes control in the name of her son. She offers a truce which Aurangzeb rejects, so the war continues. Mother and regent. Exiled to Kolhapur. Tarabai leads the Marathas across the River Narmada and enters Malwa, then in Moghul hands. The ensuing battle is a decisive one. The Marathas emerge victorious after a drawn-out and fiercely-fought battle, effectively ending Moghul dominance on the Indian subcontinent. With the death of Aurangzeb, the refugee Rajput, Durgadas, is able to reclaim Marwar. Shivaji also advises the Bundelas of Panna to establish an independent domain. The new Moghul emperor, Bahadur Shah, releases Shahu, son of the dismembered Sambhaji, and he challenges Tarabai and her son for the throne. A short civil war sees Tarabai and Shivaji defeated and sent away to Kolhapur which they govern as a princely state. Not being especially interested in becoming involved in the politics of government, the mild-mannered Shahu appoints a Peshwa (chief minister) as head of state with certain conditions that he must follow, making the position an hereditary one. The Peshwas become the de facto leaders of the empire, while Shivaji's successors continue as nominal rulers from their base in Satara, while subsidiary branches rule their own domains in Baroda, Kolhapur, Nagpur, and Thanjavur. A union of three Rajput states, Mewar, Marwar, and Amer, fails and the increasingly powerful Maratha empire is able to conquer the entire Rajasthan region. Grandson of Raja Ram & Tarabai, adopted by Shahu I. The Moghul vazir, Gazi ud din, controls the imperial throne from 1754, installing the next emperor and working with the Marathas to help them consolidate their power in the north. In 1759 they briefly capture Delhi itself. Adopted son. Figurehead between 1803-1808. 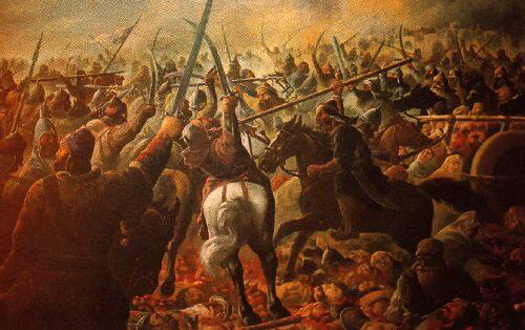 The Peshwa sends an army to challenge the Afghans, and the Maratha army is decisively defeated on 13 January 1761 at the Third Battle of Panipat. Maratha internal feuding has cost them greatly in this battle, especially their failure to agree with the Jats and Rajputs, which checks their expansion, prevents the capture of Delhi, and encourages the fragmentation of the empire. Many Maratha lords are killed, including the ruler of Dhar (even today the phrase in Marathi, 'meet your Panipat', has a similar meaning to the phrase 'meet your Waterloo' in English). Delhi is again captured by the Marathas, but this time they hold onto it for a longer period. The First Maratha War takes place against the British East India Company. The Maratha empire becomes a looser confederacy, with political power resting in a 'pentarchy' of five Maratha dynasties: the Peshwas in Pune, the Sindhias of Malwa and Gwalior, the Holkars of Indore, the Bhonsles of Nagpur, and the Gaekwads of Baroda. The Marathas have recently evacuated Delhi, so the opportunistic Afghan Rohillas march on the city, but financially, Delhi is already bankrupt. Finding nothing to loot, the Afghans blind Shah Alam II just before the Marathas return to save him and drive away the Rohillas. By 1802 a situation of near civil war exists when two Peshwa generals, Daulatrao Shinde of Gwalior and Yeshwantrao Holkar of Indore, start fighting between themselves. Bajirao II aligns himself with his mentor, Daulatrao. However, Holkar ultimately triumphs, and Baji Rao flees to Bombay in September 1802, to seek help from the British who, fresh from their successes in other parts of India, are waiting for an excuse to take on the Marathas. But the Peshwa's move infuriates the Shindes of Gwalior and the Bhosales of Nagpur, who consider it a insult to Maratha self respect. They chose to fight, in the Second Maratha War (1803-1805), but both are defeated by the British. The Holkars of Indore join the war late, and eventually force the British to agree peace terms. With Maratha power showing cracks due to the internal politics between the Peshwas and their sardars, the British also attack Delhi in 1803. The emperor is helpless against them, and they keep him as a figurehead until his death. Last Maratha emperor. Relegated to Satara. The Third Maratha War results in a decisive victory for the British against the Peshwa in India. The last Peshwa, Baji Rao II, is defeated, and the Maratha empire is largely annexed, bound by treaty to the British Crown. The Marathas appear to rule, but are little more than puppets. The Maratha heartland of Desh, including the Peshwa capital of Pune, comes under direct British rule, except for the states of Kolhapur and Satara. Satara was the original heartland of the Marathas before the empire was created. Following the final Maratha defeat at the hands of the British in 1819, Satara was one of two Maratha principalities which were allowed by the British Bombay presidency to survive the fall of empire, the other being Kolhapur. However, although relations between Pratap Sinh and the East India Company were initially cordial, they eventually broke down, and the king was removed from his throne and banished to Benaras. Former Maratha emperor. Dethroned and exiled. 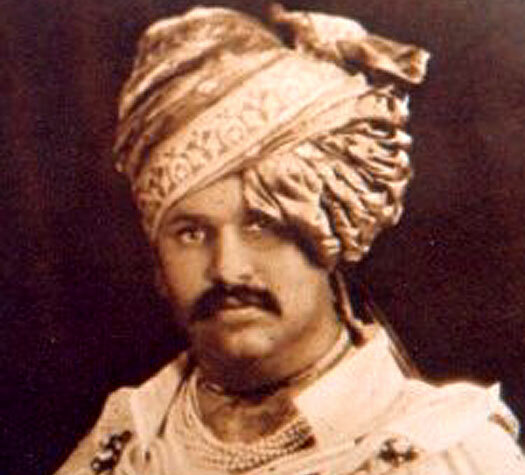 Shahaji III is also known as Abba Sahib II or Jangli Sahib Bhonsle Maharaj. He, like Shahu II Raje, is also the birth son of Shrimant Sardar Trimbukji Raje Bhonsle. He is adopted by Maharajah Pratapsinh to succeed him in 1839. On the death of Shahaji III, the Doctrine of Lapse is invoked in order to veto the succession by his adopted son, Venkuiraje Bhonsle. Instead, the state of Satara is annexed to the Bombay presidency, and Venkuiraje Bhonsle is left with nothing more than an hereditary title. Kolhapur remains a princely state until India's independence from British rule in 1947. Modern Satara falls within Maharashtra state. In 1848 Satara fell directly under British rule, while the Maratha seat of Kolhapur was recognised by the British as the actual throne of the Marathas. In Satara, the Maratha heirs retained the right to use the title of maharaja without holding any power, with Shahaji's adopted son being the first to be accorded this status. Adopted son of Shahaji III. 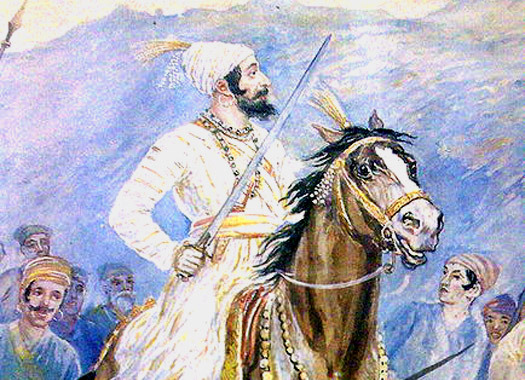 Like several generations of Marathas before him, Pratapsinh remains childless on his death. His widow, Tara Bai, takes the traditional approach and adopts a son to succeed him. Both these two Maratha princes remain childless at death, so the widow of Bhav Sahib, Tara Bai Sahib Maharaj, has to adopt a son to succeed him. Fortunately, Pratapsinh II, is able to produce his own heirs. Son and now a prominent politician.